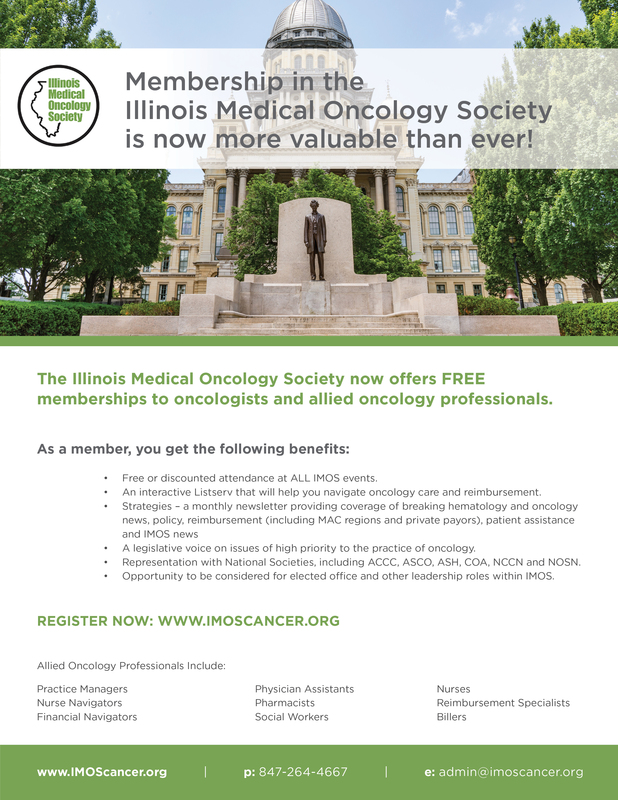 The Illinois Medical Oncology Society now offers FREE memberships to oncologists and allied oncology professionals. Free or discounted attendance at ALL IMOS events. An interactive Listserv that will help you navigate oncology care and reimbursement. A legislative voice on issues of high priority to the practice of oncology. Representation with National Societies, including ACCC, ASCO, ASH, COA, NCCN and NOSN. Opportunity to be considered for elected office and other leadership roles within IMOS. Regular - Physician oncology and/or hematology specialist who is licensed, certified or eligible to be certified, and practices in Illinois. Associate - Allied healthcare professionals including but not limited to registered nurses, nurse practitioners, physician assistants, pharmacists, cancer registrars, administrators, office managers, or other health professionals. each. Fellow - Healthcare professional participating in an oncology sub-specialty training program in IL. Retired - Individual eligible to be a Regular member but is no longer practicing oncology. To Join Online, Click here! Click here to download the offline registration form. IMOS corporate membership provides businesses with the opportunity to align themselves with medical, radiation, gynecologic and neurological oncology practices throughout Illinois. Advertisers are able to reach the oncologists and practice decision makers via advertising in society newsletters, websites, and at business, educational and legislative conferences. Contact Carol Teal Christner at [email protected] if you have any questions. © Copyright 2019 Illinois Medical Oncology Society. All rights reserved.